Intuit Accessibility Summit 2017 was held at their Bangalore office on October 12th. This year’s topic was “Accessibility for all”. 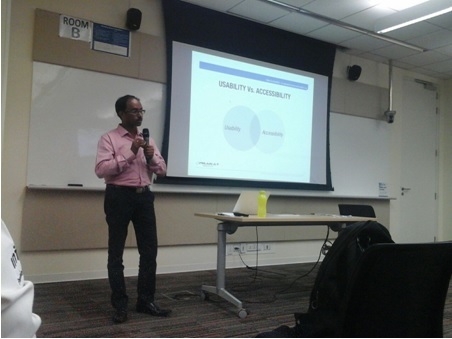 Ashwin (CPACC certified Accessibility Specialist) from Prakat Solutions presented a tech talk on “Accessibility is essential for some but useful to all”. 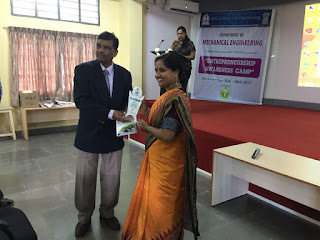 Interesting topics were unfolded with appealing personal experiences. He said disability is a design impact not medical impact. Our inaccessible designs are making people disables. We need to think of various innovative solutions to break barriers faced by people with special needs. He presented various myths about accessibility. Accessibility will not just benefit a small minority but it covers a wider category of people with temporary, episodic and age-related disabilities. Accessibility is often an afterthought in product development lifecycle. The right thing to do is to have accessibility in mind from the development stage. Most people think accessibility is hard and expensive. But the truth is, one has to have passion and a basic understanding of challenges faced by people with disabilities in using ICT products. Secondly, it's expensive only if it is an afterthought. ‘Accessibility is ugly’ is another myth where people think accessibility fixes impact UI and decreases the performance of their product. Actually, 90% of accessibility fixes happen on DOM (Document object model) which is totally invisible to normal users. Another interesting fact about Usability Vs. Accessibility is usability best practices increases the accessibility of the product and vice-versa. At the end, various benefits like how accessibility increases public perception on an organization, compatibility, SEO and legal implications were discussed in brief. Ashwin shared his own experiences of different sites which are made Accessible and explained how it really helps. The team at Intuit appreciated the in-depth knowledge that Ashwin has on topics of Accessibility and invited him for next year session.